Professor/Associate Professor/Assistant Professor jobs vacancies. Interested and eligible job aspirants are requested to apply with in 15 days. Check out further more details below. 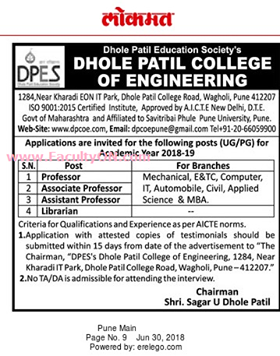 About College: Dhole Patil College of Engineering (DPCOE) is a premier Engineering and Management College in the city of Pune, Maharashtra, India. DPCOE was founded in 2008 with the objective of providing quality technical education of international standards and to help create students that match contemporary global requirements. Young and dynamic Sagar Dhole Patil, a visionary entrepreneur and sportsman founded DPCOE. He is backed by rich history and social development activities of the Dhole Patil family. Today, the institution is at the forefront of education including academics, sports and social activity, among the Pune colleges. DPCOE has infrastructure, technical support and facilities comparable to the best in the country.